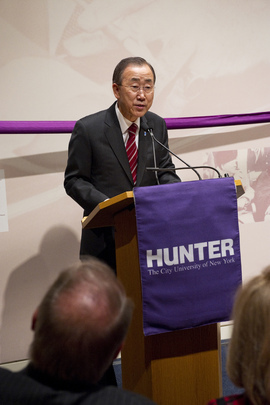 UNITED NATIONS, November 24 -- “Do you think the Secretary General would give a re-election speech at a university in New Jersey?” Ban Ki-moon's spokesperson Farhan Haq asked Inner City Press on Wednesday, two days after Ban's “major policy address” at Seton Hall. Well, yes. 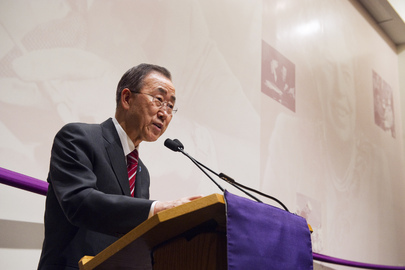 Ban's speech, replete with first person references to the effect of “I saved people in Myanmar,” was described a warm up, or off Broadway working out the kinks of, a re-election speech. Suggestion to speech writer Mike Meyer: next time, try to include more about Korea. And it's better to acknowledge UN failures, from the mass rapes in Congo to the shooting of civilians in Haiti, than to ignore them. Those present at Seton Hall on Monday compared Ban's crowd unfavorably to one drawn by Tony Blair. The questions, as it happens, were pre-screened so as to not be controversial. Inner City Press asked Haq on November 24 if any thought had been given to including Korea in the speech, given that even days before Ban delivered it, the focus of reporters covering the Security Council was on North Korea and nuclear non proliferation. Haq pointed to Ban's November 23 statement, a day after the speech. Haq was asked why Ban, in expressing his “utmost concern” about North Korea to Security Council president Mark Lyall Grant, had not asked a meeting on the topic, as he could under Article 99 of the UN Charter. Video here. Inner City Press asked about a Korean Peninsula / DPRK Policy Committee memo and meeting scheduled for December 6. We don't comment on leaked documents, Haq said, before saying that no senior official had seen the memo. So is there a unit in the UN Department of Political Affairs which drafts memos for Ban's Policy Committee? And if this is the Ban administration's attitude to New Jersey, why did Ban go there to receive an honorary degree -- which Haq declined to confirm, hours before it was awarded -- and to deliver a policy speech across the Hudson River? Watch this site. Inner City Press: I notice in the speech the Secretary-General gave at Seton Hall didn’t really seem to, other than a sort of historical reference to the UN having helped Korea in the past, there seems to have been no mention of events, whether positive or negative, in terms of Korea. I guess I wonder — at the time the speech was given, there was already a lot of discussion at the Security Council of proliferation in Korea. Was there any, in retrospect it looks like this seems to be a big, a kind of a missing, an elephant in the room in terms of that speech, which some people have described as a re-election speech. Acting Deputy Spokesperson Farhan Haq: Not every topic needs to come up in every speech that the Secretary-General gives. The Secretary-General spoke quite forcefully on the question of the Democratic People’s Republic of Korea just yesterday, and I would refer you to what he said. Beyond that, of course, we have a long-standing concern for the suffering people of the Democratic People’s Republic of Korea, particularly women and children. Inner City Press: But I guess I wanted to — if you could, and you’re very good at explaining these things. That speech seemed to only portray, there didn’t seem to be any kind of self-criticism of, let’s say, doubts that have arisen in Haiti, or the mass rapes in the Congo. Everything was “the UN is needed and is doing its job, it’s excellent”, and some people have described it as a re-election speech. Is that how we should read that speech? Seton Hall said it was going to be a major policy statement. Acting Deputy Spokesperson: You’re suggesting that the Secretary-General of the United Nations would do a re-election speech at a university in New Jersey? Inner City Press: I guess I am asking you. Acting Deputy Spokesperson: I think your question answers itself.